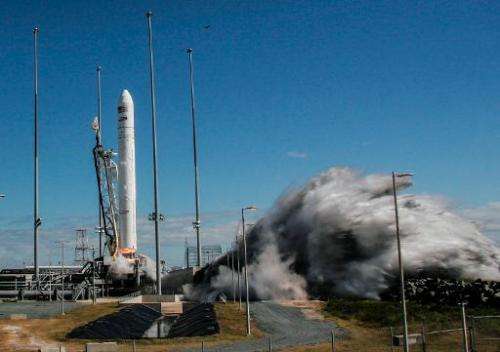 A privately-operated unmanned cargo ship built by Orbital Sciences Corporation left the International Space Station on Tuesday after its first successful demonstration mission, NASA said. After undocking from the orbiting research outpost with the help of a robotic arm directed by astronauts on board the station, Cygnus fully separated at 1131 GMT as it was over the Atlantic Ocean. Images of the operation were broadcast live on NASA TV. The capsule was to perform a series of maneuvers to position itself to re-enter the atmosphere on Wednesday, October 23 at 1818 GMT, when it will burn up over the Pacific Ocean east of New Zealand. The unmanned spaceship attached itself to the ISS on September 29, marking the first successful demonstration mission of a cargo resupply flight by Orbital Sciences. It is the fourth such mission by a private company to ferry supplies to global astronauts, a capacity the United States lost when the space shuttle program ended in 2011. In 2012 California-based SpaceX, owned by entrepreneur Elon Musk, became the first private enterprise to send its own cargo-bearing spacecraft to the ISS and back. Both companies have billion-dollar NASA contracts to deliver cargo to the ISS on multiple missions over the coming years. Unlike SpaceX's Dragon capsule, Cygnus cannot return to Earth intact. NASA said astronauts have loaded Cygnus "with items no longer needed" aboard the ISS and that these will also burn up with the spacecraft when it plunges back to Earth. With billions of dollars from NASA not to mention the free technical support and almost free launch facility access typically costing hundreds of millions by themselves i would hardly call these 2 companies fully private. That's like calling the US military a private sector. Because of the companies who deliver both to military and to private weapons buyers. Space X is entirely private, initial funded by Elon Musk's own pocket, the money they have from nasa is to fulfil a contract, it doesn't cost you twenty quid to drive six miles does it but you will pay that money to a taxi firm. its the same principle.